Corpus Christi, Texas— An experienced internet entrepreneur in Corpus Christi has launched JustGoFishin.com, an online search engine and directory serving the region’s sport fishing community. For the thousands of locals and visitors who fish the Texas Coastal Bend each year, JustGoFishin.com promises a one-stop source for all their angling needs. Although the site is only in its first months of existence, JustGoFishin.com already has more than 5,000 visitors daily, and Alexa.com ranks it as one of the most heavily-trafficked internet sites in the Coastal Bend area. Visitors to the website will find a continuously expanding directory of fishing guides, marinas, outfitters, and many other categories of interest to fishing enthusiasts. 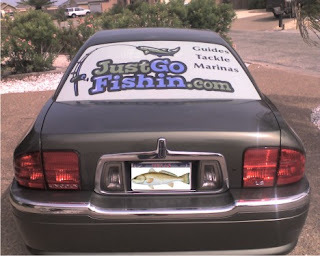 JustGoFishin.com users can also find notices about upcoming tournaments and other events relevant to the sport fishing community. The site features links to up-to-the-minute tide and weather reports, fishing-related tips and articles, and travel accommodations. Thanks Captain Brandon for your feedback with JustGoFishin.com. We continue to grow as the Texas Coastal Bend Internet resource to guides, tackle & marina's. Have a great day of Fishin! Hey, check this out... we just added a new banner on our Lincoln LS. Our friends at Sandbar Signs created and installed this last week. What's nice is you can see through this banner from the inside. 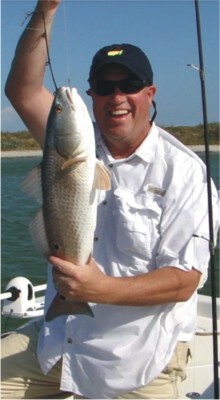 Bud Baker released this nice 35" Redfish on July 12, 2008. Fishing with his son Chris & "Guided" by Victor at 9 mile hole. Subject: Thank you for the support! THANK YOU for contributing to the 16th Annual ABC Fishing Tournament. Through your generous support, this year’s event met and exceeded our anticipated goals! 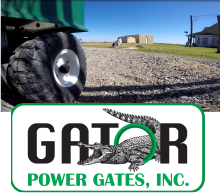 We could not have done it without companies and individuals like you. The 2008 Fishing Tournament registered 83 as individuals, 24 teams, and 10 kids’ entries. The weather was great, the food was delicious, and the fishing superb! If you were there you saw it first hand, if you missed it, well you missed a fantastic tournament. This year’s tournament even had media coverage! The 2008 ABC Fishing Tournament committee, volunteers, board of directors and staff appreciate your generosity to make this year’s event the best ever. Again, thank you for supporting the 16th Annual ABC Fishing Tournament and we hope to SEA ya next year! Always great to get feedback of appreciation. Check-out their tournament in pictures. Were looking forward to next years fishing competition. 27 1/2" Trout caught Saturday July 12 in Emmords Hole using plastics. JustGoFishin certainly recommends Captain Ken's Guide Services for a great day of fishing at Matagorda Bay & Gulf of Mexico. 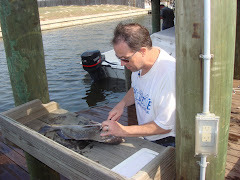 Check-out his website linked up in JustGoFishin.com or type in key word "Captain Ken" in the search field. 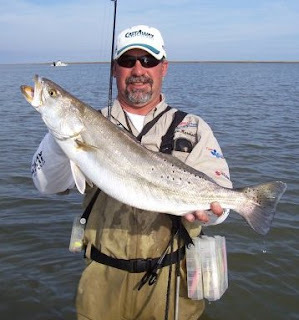 Check-out Captain Ken's updated fishing report to learn about his recent catches. You certainly can tell he enjoys his career on the water. So if your ready for an awesome outdoor adventure... Give Captain Ken a call. Don't forget to tell em JustGoFishin sent you. We are just thrilled with the growth of JustGoFishin! We are ahead of schedule in developing our database and soon launching into the Texas Coastal Bend consumer. Our Tackle Box and Lures Categories have grown with some outstanding companies online. We hope you'll try them out and give us your feedback. Tell em JustGoFishin sent you! Have a GREAT Fishin Day!!! Amie Clanton caught this 27 and 7/8 inch Redfish with over 650 spots fishing 6/17 in the Upper Laguna Madre with Captain Alan White. This one is going to the taxidermist. The Corpus Christi Law Enforcement Fishing Tournament (CCLEFT), benefiting the Police Athletic League (CC-PAL) and other local Coastal Bend charities, is seeking sponsors for the 2008 fishing tournament. The CCLEFT was formed by members of the Corpus Christi Police Officers Association Fishing Tournament board in April 2008. Over the past five years, the tournament became so successful and grew to such a size that it became necessary, due to efficiency and effectiveness factors, to organize as a separate non-profit. The tournament has two main goals: an entertaining weekend for Public Safety personnel and their guests and fundraising for local non-profits, such as the 2008 recipient, CC-PAL. The tournament traditionally kicks off with a meet and greet social event that in 2007 attracted over 600 anglers and their guests from across the state, making it an ideal venue for vendors to showcase their companies and products while showing support for area law enforcement. On tournament day, after fishing, the anglers and their guests meet for an awards ceremony, dinner, a silent auction and door prizes. The Corpus Christi Police Athletic League (CC-PAL) was established in September 2002 by a handful of CCPD officers and a group of concerned citizens with the goal of providing healthy entertainment for area youth. CC-PAL is sponsored by the CCPD, but receives no City funding; therefore, it relies heavily on private contributions from the community. The organization’s main focus is on sports, including baseball, softball, martial arts, volleyball, basketball, cheerleading, tutoring and summer camps. CC-PAL currently serves about 1,600 children, 90% of who come from economically disadvantaged families. The programs are offered to participants free or at minimal cost. Sponsors are also being recruited to donate auction items and door prizes such as hunting or fishing trips, food and other items. 2008 sponsors already committed include The Corpus Christi Police Officers Association, Los Jefes Ranch, L & F Distributors, Manti, Motorola, Sandbar Graphics, The Scott Ranch and Seahawk Charters. If you or your company is interested in a sponsorship or other donation to this worthwhile event, please contact one of the CCLEFT board members listed below. 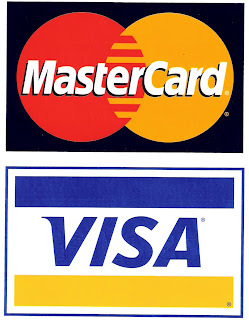 We've now made it easier to purchase online our marketing products. Great time to upgrade and get a "Paid" value attached to your link. This "Paid" value catapults your listing to the top of our Directory & Key Word Search at JustGoFishin.com. Checkout our Sheepshead Package... Get 2 Listings in categories of your choice in a "Paid" value. Your listing will get priority above all "Affiliate & Guest" values.